Looking for a great idea to make cheap and beautiful flowers? 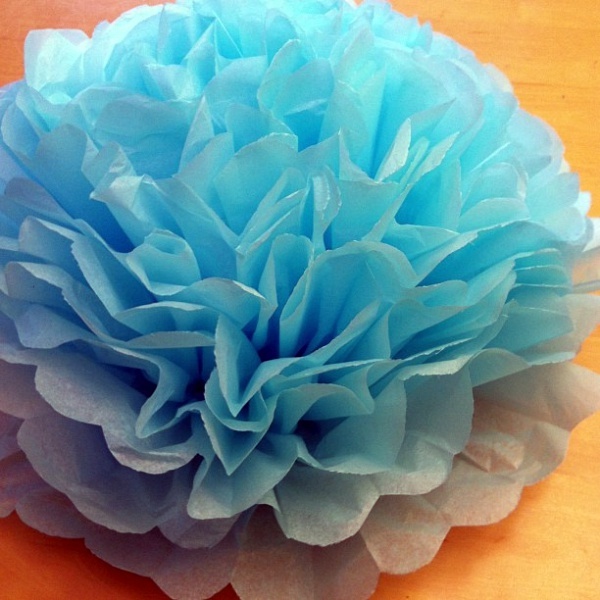 Tissue paper flower will be the best choice for you. It’s easy and pocket-friendly solution. 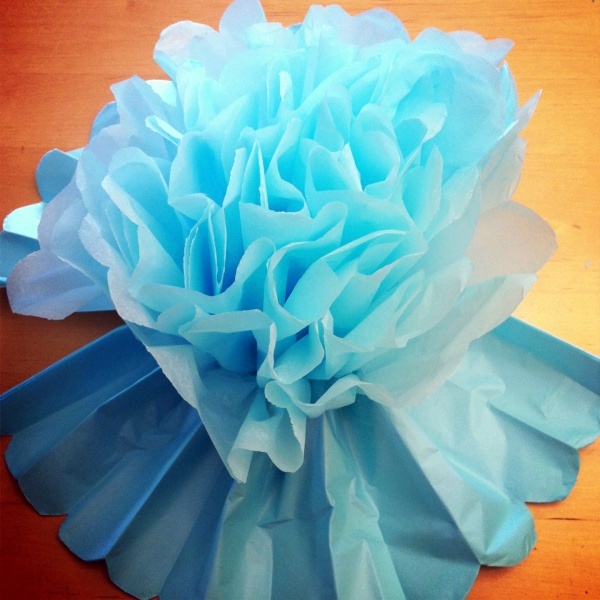 Giant tissue paper flower looks beautiful and gorgeous. If you are not a crafty you don’t have to think about that. Once you see the flower in this tutorial, you will tell on your own that you will be making the project. 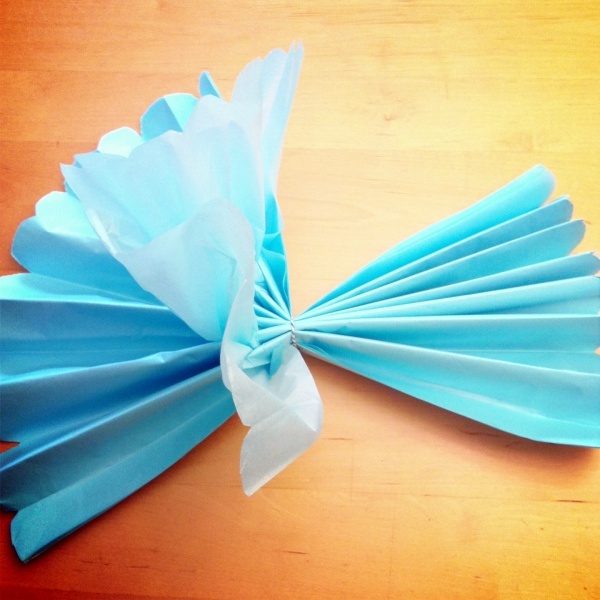 Still thinking how to make a giant tissue paper flower? Now probably you are wasting your time as we thought you are really interested in making one. Here are some amazing bunch of ideas on your mind for reusing glasses. Before we start making the project it is better to know what else you need to make out the whole project. It is very important to gather all these equipment before you proceed to make you own tissue paper flower. Here is the list. String or Yarn to tie the tissue paper flower at the base. Count 10 sheets of paper and stack them up one above another as shown in the picture. Keep these stack on a flat surface where you get a lot of space. Remember that the shorter side of the tissue paper should face you. So do you know about accordion folds? Accordion fold is a zigzag folding style that we found in the bellow of the accordion. The folds should be 1 inch wide. Here you can see half of the paper is folded, you should fold the full paper like this. 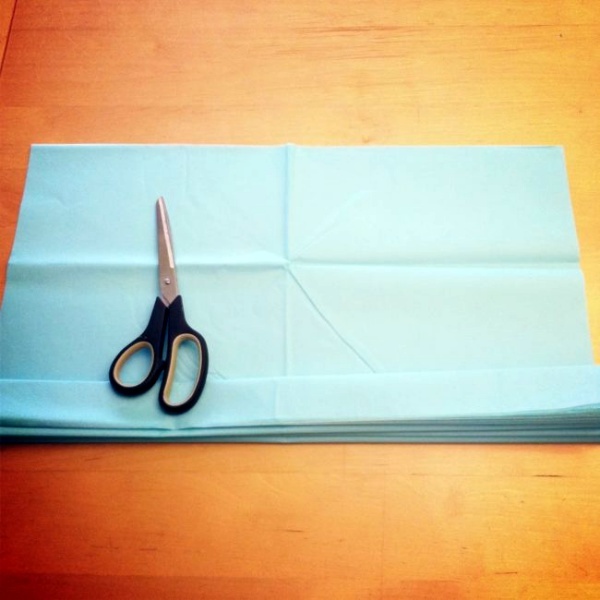 Now once the full sheet of tissue paper is folded, take the piece of string or yarn and tie the sheet just at the half pint of the sheet as shown in the picture below. 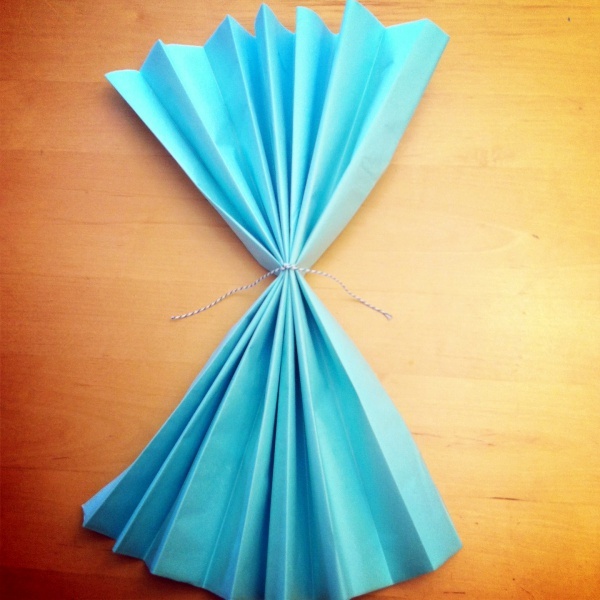 It is better to fold the tissue in half so that you get the point to tie the string. This Step is very crucial as you will be cutting the petal shape of your flower. 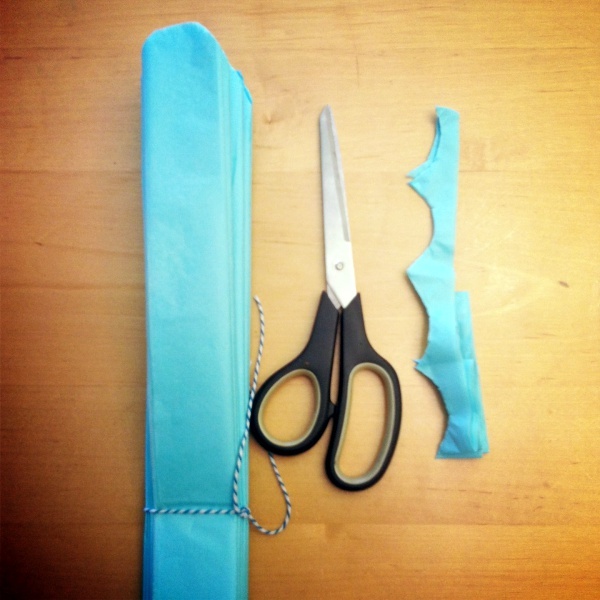 Cut the petal shape out of each side of the tissue paper. You have two opposite sides and you will have to cut both of them. Now we should tell you, you can cut the shape as you want. That means it depends on which kind of flower you want to make. This shape will make the whole petal shape of your flower. Take one sheet at a time and pull it upwards to make the fluffy petals. In this step, you should handle the whole thing very gradually as if it tears the whole project will be a mess. Handle with care as tissue papers are very soft. Go with the same procedure with every sheet. And slowly you will see the flower is emerging. And as you complete, you will see what you have made. Isn’t it really interesting? You have made such a beautiful flower within just a few minutes or so. Can you really believe it? Here you can learn how to make paper beads for jewelry making. As we have said, the process is really very easy and anyone can try to make it. It doesn’t need a great crafting skill and if you think you are the one who makes craft only to make certain useful things, this one is the best for you. even if you have a kind who is at least 7-9 years old can help you in this procedure to male giant tissue paper flowers. Check out our other tutorials on making paper flowers and even you can try out that for your home decoration. 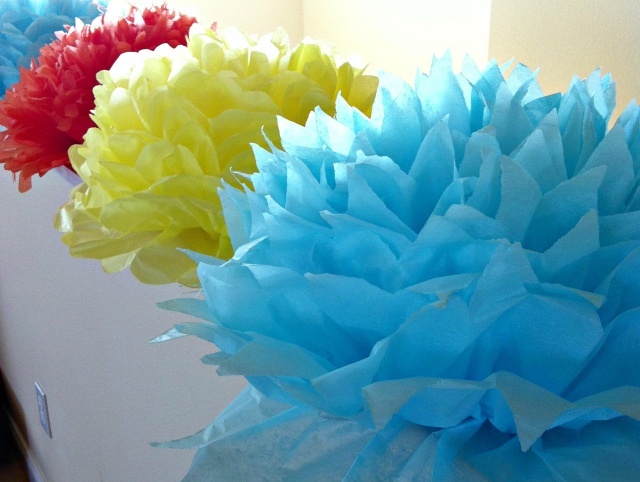 So now as you have a made a giant tissue paper flower, use it to decorate your full home this summer. Try out with different colors.